Australia’s deteriorating strategic outlook raises the question under what conditions should we develop a nuclear weapon of our own? This option was seriously considered by Australian governments in the 1960s, and the Department of Defence kept the technological lead time for an Australian nuclear weapon under review until the early 1980s. That was at the height of the Cold War and, as one of America’s closest allies, we faced a real risk of Soviet nuclear attack. We face no such risk these days. Nevertheless, we now have the prospect—for the first time since World War II—of a potential major-power adversary threatening us with high-intensity military conflict in our neighbourhood. This is not to identify China as an inevitable adversary, but prudent defence planning needs to accept that Beijing is developing the conventional military capabilities to threaten us seriously—were its intentions to change. Military developments in our region of primary strategic concern now require a change to our assessments about intelligence warning time. So far, Trump hasn’t been critical of Japan on alliance matters. However, Tokyo spends only 1% of its GDP on defence and could become a target for his criticism of allies that allegedly don’t pay their way on defence. A looming uncertainty for Tokyo is whether Trump will do a deal with North Korea on its ICBMs but leave its short- and medium-range nuclear weapons untouched. That would create grave uncertainty in Tokyo about the dependability of America’s extended nuclear deterrence. Japan has the latent capability to develop its own nuclear weapons relatively quickly. In any case, we need to prepare for the prospect that we will come under increasing pressure from the Trump administration to spend more on defence and to become more able to defend ourselves—if necessary from a heavily armed China. If, in extremis, we can no longer depend upon the US to defend us from threats from a nuclear-armed China, Australia might have to revisit the technological lead time we need to develop an independent nuclear weapon. This would be a momentous step to take, requiring us to withdraw from the Nuclear Non-Proliferation Treaty by claiming that extraordinary events had jeopardised our supreme national interests. In the classified guidance of Australian defence policy in 1968, the defence committee’s recommendation to the government was, ‘should a serious breakdown in the international order appear likely to develop, Australia might wish to reconsider the possibility of a requirement for a nuclear capacity’. The question now is whether we have arrived at such a breakdown in the international order. My answer to that is: not yet, but we need to monitor events very closely. Let me be clear: just by raising the nuclear option I recognise it’s a highly contentious matter. There are grave moral issues involved in going nuclear, as well as likely severe international ramifications. 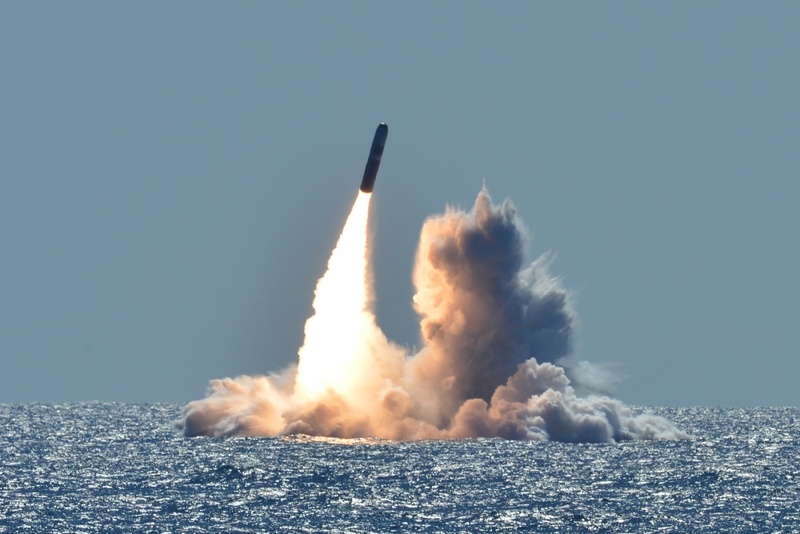 And although it may be relatively easy for Australia to develop a nuclear bomb within, say, five years of a decision to do so, there would be perhaps insurmountable difficulties in acquiring a deliverable weapon system. The UK Ministry of Defence estimates the cost of its next-generation Dreadnought SSBNs at about $55 billion for four boats, plus a contingency of $20 billion. It also estimates the cost of sustaining the Trident missile replacement program over 35 years to be $300 billion. The only other credible option is for us to develop a strong conventional force capable of denying the approaches to Australia to any well-armed adversary. That would demand a substantial increase in our defence budget, but it would leave us vulnerable to Trump’s ambiguous ‘America First’ version of extended nuclear deterrence. Paul Dibb is emeritus professor of strategic studies at The Australian National University. Image courtesy of the US Department of Defense.